Pop-up will replace fuel pumps with make-up refills. YSL Beauty is heading out to California's Colorado Desert for this month's Coachella festival with a concept store resembling a gas station. 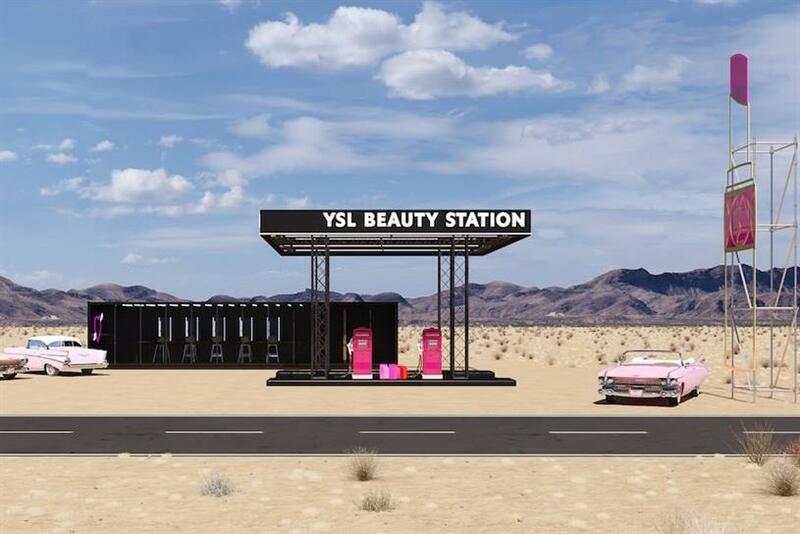 A "lip station, pop-up shop and content creation set" rolled into one, the "YSL Beauty station" will be located on Route 111 in Palm Springs. Opening at 3pm on Friday 12 April, and from 10am on the two following days, it is designed to attract visitors on their way to and from the first weekend of Coachella 2019. The pop-up will feature a "make-up oasis", with make-up refills instead of petrol pumps, a make-up vending machine and virtual-reality headsets that will allow shoppers to virtually try on 50 lipstick shades. There will also be set pieces for visitors to take photographs, with props including pink retro cars, heart-shaped balloons and giant lipsticks. The concept store coincides with the launch of YSL products including Touche Éclat High Cover Radiant concealer, Rouge Volupté lipstick and Volupté Plump-in-Color lip balm. Coachella 2019, which takes place over two weekends (12-14 April and 19-21 April), features a line-up including Tame Impala, Aphex Twin, Chvrches and Ariana Grande.